PHOENIX — Once known for her progressive politics, Rep. Kyrsten Sinema has coasted to the center in her first re-election. The freshman bills herself as bipartisan, and now party operatives — even Republicans, privately — view her as the safest of the state’s three vulnerable Democrats. But that&apos;s also because she&apos;s lucky: A brutal Republican primary is bound to leave her future foe broke and bruised 10 weeks before Election Day. On the campaign trail, Sinema stresses her work across the aisle. It&apos;s a political necessity for a member who represents a district President Barack Obama won by just four points. Sinema started her elected career nearly a decade ago at the state House, 10 miles away from this Sheraton conference room. Some of her first political experience came working for Ralph Nader’s spoiler 2000 presidential bid. She tried her own third party attempt in a losing race for the state House as an independent affiliated with the Green Party two years later. She finally won the seat as a Democrat in 2004. In 2012, Republicans were elated when Sinema won a brutal Democratic primary because they viewed her as the weaker candidate, thanks to her liberal record. They cited some of her comments and positions as "too far out" in television advertisements . 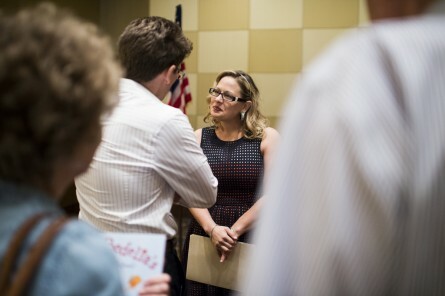 But after arriving in Washington, Sinema joined the Blue Dog Coalition and the bipartisan Problem Solvers Caucus. She boasts about her work with conservative Rep. Dan Benishek, R-Mich., on veterans&apos; legislation. It&apos;s a salient issue for Phoenix given its local VA hospital sparked the national scandal . Sinema tells a story about her first few weeks in Congress, when she attempted to listen to a bill hearing on Capitol Hill closed-circuit television. She couldn&apos;t find the feed, so she asked Democratic leadership, who informed her that some bills go straight to the floor for a vote without debate or hearing. They explained that Democrats did the same procedural work-around when they held control of the chamber. She&apos;s known for these witty one-liners, often interjecting colorful, self-deprecating comments into speeches and one-on-one conversations. She looks young for her career? Must be her curly hair, she quipped. Tequila tips? She&apos;s got them! Good news: Congress passed a budget for the first time in four years! “I mean, it’s Congress," she deadpans. The 9th District encompasses the eastern part of the Valley of the Sun, surrounding downtown like a backwards "C." This is a newly drawn district, created after redistricting to account for population growth in the sprawling Phoenix area. It includes liberal strongholds she used to represent in the legislature such as Arizona State University in Tempe. But there’s also ardent GOP territory on the district&apos;s east side in places like Mesa, and more moderate Republicans in the Camelback Corridor and Ahwatukee Foothills. She’ll face the winner of the Aug. 26 primary, either former ASU Football quarterback Andrew Walter or ret. Lt. Col. Wendy Rogers. They won&apos;t have much time — early voting starts six weeks later. Privately, Republicans view Walter, now a local businessman, as a slightly better general election candidate, if only because Rogers was criticized for taking an unpopular political position in 1012, when she told a group of local conservatives she would like to see Social Security "phased out" or privatized . But Walter is green. In a disastrous interview with the Arizona Republic&apos;s editorial board last month, the former jock said he wasn&apos;t familiar with the details of the bipartisan immigration overhaul bill the Senate passed last year or deportation options for the influx of child migrants from Central America. Neither Republican made themselves available for this story the few days Roll Call was in the district. Back at the rotary luncheon, Sinema details her multiple degrees and unusual path to Washington. The former Mormon rose from poverty to get a full scholarship to college and become a social worker at nearby Sunnyslope Elementary School. She doesn&apos;t mention that she was Congress&apos; first openly bisexual member. Sinema spent seven years in the state House, followed by a two years in the state Senate before winning a close race for Congress in 2012. This fall, her greatest challenge will be turnout. Her campaign team estimates Democrats could drop off as much as 6 percent without a presidential race on the ballot. But she also doesn’t face a primary challenge, and her campaign bank account shows it: She reported $1.59 million in cash on hand for the race at the end of June. This race is rated Democrat Favored by the Rothenberg Political Report/Roll Call. Freshman Democrat Rakes in More Than $580,000 Republicans Circulate List of Top Female House Candidates DCCC Reserves $43.5 Million in TV Airtime for Midterms Shooting in the Rear View, Ron Barber Drives His Own Way Roll Call Election Map: Race Ratings for Every Seat Get breaking news alerts and more from Roll Call in your inbox or on your iPhone.